“I’d escape from rehab. Then maybe take myself to a spa for a few days. Fresh air, long hikes, nothing stronger than aspirin and iced tea. That was the ticket.” How glibly addicts deceive themselves. 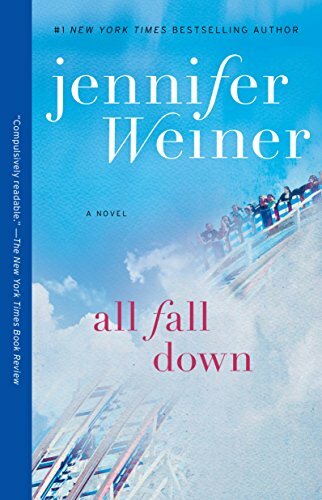 In All Fall Down, Jennifer Weiner’s 11th novel now in its paperback release, we meet Allison W., a successful, over-educated suburbanite who seemingly has it all—husband, career, treasured daughter, big house—everything she thought she wanted. But the relationship with husband Dave has become strained, his book contract is suddenly cancelled. He needn’t return the advance, but there won’t be any more money coming in. He now sleeps in the guest room. Allison picks up the slack, winning notice as a journalist who, aware of the irony, blogs about marriage and motherhood. Her success lands her on talk shows and panel discussions. Her inbox grows fuller by the week. And yet she still has to manage her distant husband, her demented father, her ineffectual mother, and her bossy, hyperactive daughter who wets the bed. Alison can handle this full plate, cant she? She can, with the help of the Percocet and Vicodin left over from a back injury back at the gym. Even so, we see signs of procrastination and shunted responsibilities: the gym clothes she lays out Sunday evening remain untouched on Thursday morning. So many books about addiction deal with the train wreck typically involved. Weiner’s narrative smartly focuses on the interior thoughts by which Alison spirals into her dependence on pills. Convinced that they help her “get through the day” and are “no different from a glass of wine,” Alison soon scams physicians ignorant of how many other doctors she’s gone to pleading for pain relief. Her primary physician even ups her meds to Oxycontin, unwittingly enabling her. When she asks if Alison wants to “talk to someone,” Allison demurs, reaching instead for the Altoids tin in her purse that holds her stash of narcotics. She promises herself “I’ll cut back,” but of course you can’t limit yourself to two pills when you want handfuls. Ambivalence and an inability to stop are the defining features of addiction. Her habit becomes increasingly expensive and hard to hide when she resorts to buying Oxycontin on the Internet once her physician supplies are exhausted. Stoned on 20 of them one day as she collects her daughter from school, the teacher monitoring the pickup line sees that something is wrong and wrests away Allison’s keys. Involuntary rehab follows. Alison rebels against the rules, fails to identify with her fellow inmates, and convinces herself there’s been a mistake. “How does a suburban lady who is pushing middle age end up in rehab? How does this happen to me?” She’d convinced herself that pills helped her make it through the day. She plans an escape, entirely plausible in her mind. But near the story’s end comes a surprising twist, and then a felicitous dénouement that explains much of what had baffled her as a child. By the end, Weiner has taken a complicated, nuanced, and fraught subject and given us a narrative both entertaining and enlightening.